This recipe is an excellent balance of protein, fat, and carbohydrates to keep your blood sugar stable. Dysphagia Level 1 – Pureed – omit spaghetti squash, cook meatballs according to recipe. Puree meatballs in a blender, adding chicken stock until smooth. Serve on a plate or in a bowl. Top with smooth tomato sauce and melted cheese. Dysphagia Level 2 – Ground/Mech Soft – cook according to recipe, but finely chop cooked spaghetti squash and meatballs and serve on a plate or in a bowl. Top with tomato sauce and melted cheese. Preheat oven to 350ºF. Lightly spray a baking sheet with cooking spray. Cut spaghetti squash in half lengthwise. Scoop out seeds and discard. 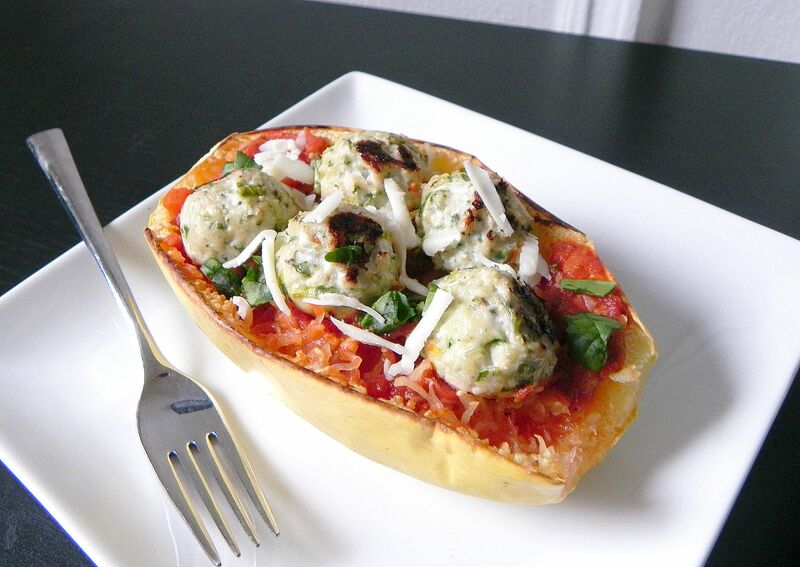 Place spaghetti squash halves cut side down on baking sheet and bake for 40 minutes. Meanwhile, combine turkey, onion, garlic, parsley, basil, egg, and ground pepper in a large bowl. Using a small cookie scoop, form mixture into 12 meatballs and place on a baking sheet lined with aluminum foil sprayed with cooking spray. Bake in oven for 10-12 minutes, flip meatballs, and bake an additional 5-7 minutes. Remove squash from the oven and fluff the flesh with a fork. Top each squash half with 1/4 cup tomato sauce and 6 meatballs. Sprinkle grated parmesan cheese on top, if desired.